Dec. 17, 2008 -- The Fowler Center Series presents the Ma’alot Quintet in performance Friday, Jan. 16, at 7:30 p.m., in Riceland Hall, Fowler Center, 201 Olympic Drive, Jonesboro. The quintet’s name comes from the Hebrew. The quintet says that the word symbolizes harmony and musical concord. "Ma'alot" is the plural of the Hebrew word "Ma'alah", which means "step", "degree," or "ascent.” The Ma’alot Quintet has rapidly ascended to the heights of international acclaim since its beginnings in 1986. The Ma'alot Quintet quickly gained wide international recognition after winning four first prizes in major music festivals and competitions—the Jeunesse Musicale competition, Belgrade; Martigny, Switzerland; Deutscher Musikrat, Bonn; and the Munich ARD competition. 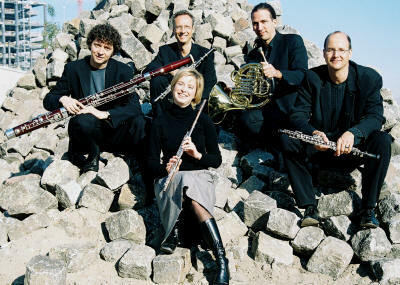 The ensemble is considered one of the leading international chamber ensembles performing today. Their repertoire ranges from the Viennese classics to contemporary material. The Ma'alot Quintet champions new music, often in close collaboration with today's composers, introducing audiences to new sounds and ideas and thereby expanding the chamber music repertoire. In addition, the ensemble also offers arrangements specially prepared for them by its members Ulf-Guido Schäfer and Volker Grewel. All members of the ensemble hold positions in major German orchestras or serve as professors at Musikhochschulen, or music schools. Members of Ma’a lot are Volker Tessmann, bassoon; Ulf-Guido Schäfer, clarinet; Stephanie Winkler, flute; Volker Grewel, horn; and Christian Wetzel, oboe. The ensemble regularly appears in the major concert halls of Germany and has been invited to many of Europe’s capitals, such as Berlin, Vienna, Amsterdam, London, Dublin, Bern, Lisbon, Belgrade, Athens, Instanbul. The ensemble has made extended tours throughout Austria, Belgium, Luxembourg, Greece, Turkey and Cyprus. Recent engagements include Beethovenfest Bonn, Rheingau Musikfestival, Mozartfest Augsburg, Bodensee Festival, Kissinger Sommer and Kuhmo, and also performances at the Berlin Konzerthaus and the Wiener Musikverein. In the United States, the ensemble has appeared, among others in New York City, Boston, Cleveland, and Chicago. Upcoming engagements will take them to the Frick Collection in New York City, the National Gallery in Washington, and the Chamber Music Society of Salt Lake City. The Ma’alot Quintet has done six recordings for Glissando that has brought it considerable critical acclaim. It now records exclusively for the MDG label. Its recently released Dvorak CD has been gaining a lot of attention and won the 2006 Echo prize; its Piazzola recording was released in the fall of 2006. Ticket prices are $30 and $20 for adults; $24 and $16 for ASU faculty and staff; $23 and $15 for senior adults and K-12 students; and $10 and $6 for ASU students. See http://www.fowlercenter.astate.edu/tickets/ for season ticket information, including prices, or call the Fowler Center at (870) 972-3471 for more information.